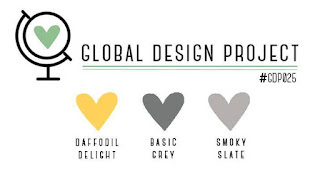 It's a colour challenge this week and it just happens to be one of my favourite colour combinations - how could I not enter?!! If you'd like to enter too, or just look at all the lovely entries - simply click on the challenge image. I stamped images from the Birthday Blossoms stamp set onto the top layer of Smoky Slate cardstock using a mix of Smoky Slate and Basic Gray inks. There was a little bit of masking involved for the three flowers and the the leaves. 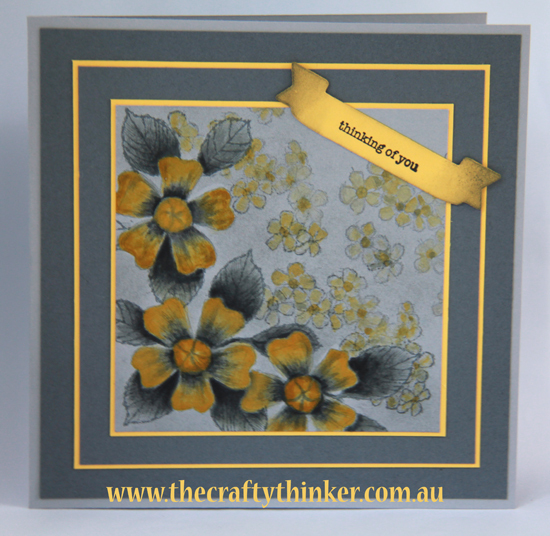 I painted the three large flowers and the leaves using Smoky Slate, Basic Gray and Daffodil Delight inks. I wanted them to "pop" as much as possible so I kept the contrasts as strong as possible. I wanted the small blossoms to pretty much disappear into the background, so I painted them very lightly and minimised the contrasts. Once I'd finished painting, I masked the large flowers and leaves again and then sponged with Smoky Slate ink. I cut a Daffodil Delight banner and stamped a greeting from Teeny Tiny Sentiments then sponged the ends with Basic Gray ink. If you'd like to make a purchase, just click on one of the product images below.